Get lifetime access to the High-Ticket Program Masterclass including implementation manuals and $3,997 in special deals and exclusive bonuses. Upgrade for the low price of $497. 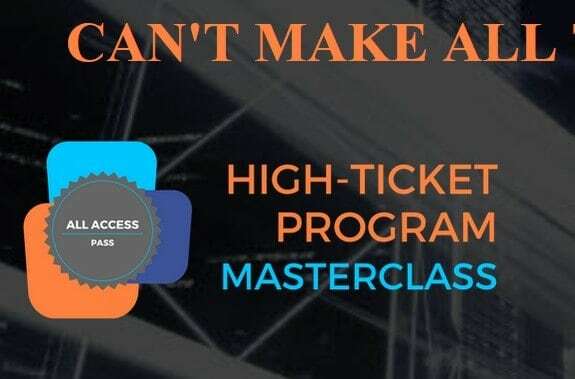 With your free High-Ticket Program Masterclass pass, you can watch the sessions up to 48 hours after they are broadcast. After that, you'll be re-directed to purchase the All Access Pass in order to get lifetime access. In this 2-hour kickoff session, we cover the core training of Module 1. Frank outlines the 5 steps necessary to build and validate a high-ticket program. He'll cover how to find the right problem to solve, how to develop your own IP, and the 5 building blocks of scalable high-ticket programs. Steve talks about how your "what" is more important than your "why". He gives guidance on how to pick that 6-figure problem you should be solving for your clients. Dorie discusses a process by which you can discover your own intellectual property. She provides examples of successful ways to Stand Out. She gives you ideas on where to find inspiration on your process. She also provides a step-by-step approach to design that process. Danny, the creator of the Course Builders Laboratory, does a deep-dive on what it takes to build a successful online course. He breaks down the first of the 5 scalable building blocks and provides guidance on how to choose the curriculum, how to ensure student success, and how to get your first pilot clients enrolled. Jay is the world's expert on running high-end masterminds and teaches hundreds of entrepreneurs each year. He is going to spill his secrets on designing, filling, and facilitating a successful mastermind. He does a deep-dive into the 2nd of the 5 building blocks of a scalable high-ticket program. Dov is going to lay out the basics of how to design and run a successful group coaching program. He'll cover the different ways you can build mentorship and accountability in such a program. He'll also talk about when group coaching - the 3rd of the 5 building blocks of a scalable program - is not a good tool. Josh is the founder of LinkedSelling, a done-for-you LinkedIn marketing agency. Josh lays out the way to create your own done-for-you service in a way that doesn't turn into another job - or make you the employee of your clients. He does a deep-dive into this 4th of the 5 building blocks of a scalable program. Creating a live event can be a very lucrative part of your business model. Joshua is going to spill the secrets on putting together his very successful JVology event series where he has sold millions of dollars of programs. We'll discuss the different types of live events you can hold - whether fulfilling a high-ticket program or upselling into another. This deep dive into the 5th of the 5 building blocks of a scalable program will help you ensure your next event is a great one. Not only is Jordan is the host of the #1 iTunes rated podcast, Art of Charm, but he is a very successful entrepreneur in his own right. Jordan is going to talk about why the "ease" of becoming an entrepreneur has not necessarily been a good thing for every one. And he's going to tell you what you need to do to avoid getting lost in the crowd. 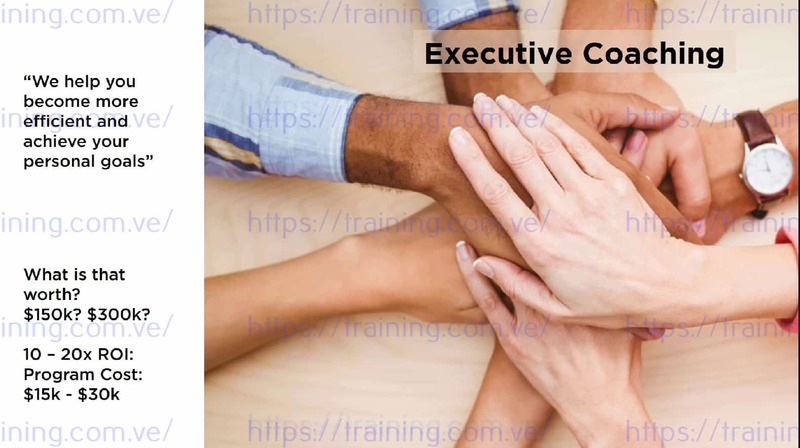 In this 2-hour core training session, we cover the main elements of Module 2. Frank outlines the step-by-step approach to craft the marketing message around your program, validate it with a core group of potential clients, then close your first 3 to 5 new high-ticket program participants. He'll also give you the week-by-week plan to accomplish this all in 90 days. Francine is a sales expert and will show you the techniques to use validation calls to tee up your first sales. She'll also show you how to draft your own sales plan - the things you need to do in order to invite people to the validation calls. At the end of this session, you'll have a script you can follow and the step-by-step approach to schedule those calls. Matthew will discuss the way to hold a sales conversation when you're trying to close a $10k deal or a $100k deal. Despite what you might think, those sales conversations are never "sleezy" or "salesy." Matthew will show you how to build trust and demonstrate value - the two critical elements to a successful high-ticket sales conversation. John is the expert of making high-valued connections. He is going to share with you the ins and outs of networking in person and online. Those initial connections could be the exact people to help you build your high-ticket program. He'll show you what works - and what doesn't - when you want to network. Daniel is the Email Alchemist. He will show you the - somewhat surprising - techniques that work and don't work when you sell via email. Some of what you think you know will absolutely be turned on its head. He will give you the formula for effective emails that get opened and responded to. Iman has done literally hundreds of profitable webinars. He will give you the secret to holding a webinar that drives people to a strategy session. That session is the key to your high-ticket program sales conversations. Learn these tested and tried strategies from Iman. They will go against much of what you've heard because a high-ticket webinar is very different from low-ticket sales webinars. Don't get them confused. Mitch is our expert on using the power of client stories to sell. He will show you how the power of a great referral strategy can launch - and sustain - your business. Done right, referrals are a powerful tool. But even better than referrals are testimonials and ringing endorsements. Find out how to get those too! Tom is going to excite and scare you with this. The traditional "30-day money back guarantee" is basically dead. What do people want instead? Find out how to use strategic risk reversal to attract clients and blow away the competition. Done well, this technique will make you the obvious choice. Lisa is going to help you become a storyteller. But a storyteller that sells. Your clients want to choose you as a service provider because your story resonates with them. If you can connect emotionally with your prospect, you have a much easier time getting them to commit to your high-ticket program. In this 2-hour core training session, we cover the main elements of Module 3. Frank describes a high-ticket program "funnel" called the Loyalty Ladder. He outlines how to drive traffic into your own Loyalty Ladder. He also discusses the different ways to use authority-based marketing to increase your market share. Ciprian is the host of the Launch with Partners Summit and experienced entrepreneur. He will show you the step-by-step approach to recruit partners for a lucrative JV webinar which will drive new customers and revenue into your business. Adam is the co-author of the bestselling book Web Marketing that Works. He is going to walk you through how to build a list using lead magnets that really convert. If you don't have a strategy to create new leads, you're just using luck to market and sell. Scott will teach you the new, high-converting technique he has created to build trust and credibility as well as convert sales. Tom will walk you through what it takes to have a successful product launch. That launch could be the one marketing strategy that puts your business "on the map." But be warned, a bad launch could be destructive. So learn from the best and do it right. Ian is a marketing automation expert. He will show you what works and what doesn't when it comes to using automation to keep track of your client base. Going far beyond the "email newsletter," today's automation tools allow you to segment your audience, react to buyer triggers, and build trust and credibility over time. Chandler is one of the world's top authorities on self-publishing for entrepreneurs. He runs the Self Publishing School which has already taught over a thousand entrepreneurs how to publish their own book. But beware of the techniques which just "look good" but don't actually bring in business. Chandler will help steer you in the right direction. Gene knows how to book speeches that get you clients. It doesn't matter if you're on stage, if you're on the wrong stage. Gene will walk through how to find the right events, get yourself booked, and then turn the speech you gave into the client-generating event you always wanted it to be. Josh is an Infusionsoft Certfied Partner who knows how to work magic with Infusionsoft. In this advanced topic session, we're going to discuss how to set up an automated system that gets your lead management flowing. We'll be taking the entire sequence from traffic to close and talking about how to set it up in Infusionsoft. Meny is going to teach us the four phases to creating lifecycle marketing for clients. Learn how to not just land new clients but grow them over time and continue to earn over their lifetime. In this 2-hour capstone training session, we will go through each step to actually build your Million Dollar Program - the high-ticket program you need to have a scalable and profitable 7-figure business. You'll work with Frank through a workbook of exercises live to start your design process. Ready To Get Lifetime Access to High-Ticket Program Masterclass and the $3,997 in exclusive bonuses?